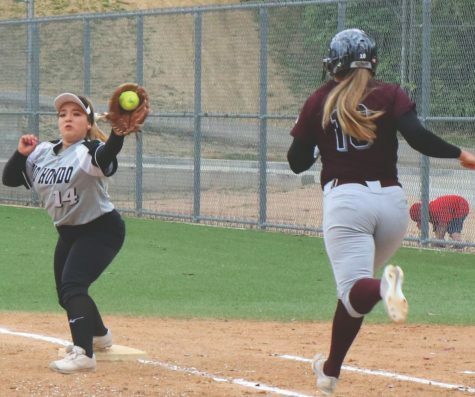 Rio Hondo women’s softball team lost to Chaffey Panthers at the Rio Hondo softball field with the score 8-2 Tuesday, April. 9. In the first inning, the Roadrunners had difficulties running towards first base, while the lady Panthers had a decent start offensively and defensively. Chaffey made couple of hits advancing to first base, but it was hard for them to score as the defense from Rio were decent. In the second inning, Rio Hondo were starting to have problems defensively. Their opponents made great hits reaching towards first base and found the gaps making the home side accelerate more for the ball. Chaffey started to play with confidence and score two early runs. When Rio Hondo were batting, the Panthers had no issues of getting them out because the ball was coming towards them and passed the ball quickly to their teammates. The ladies from Rio also made it simple for their competitors to catch the ball easily. Chaffey were starting to outplayed them and showed no fear. Chaffey batter Denise Baires hit a triple and her teammate Tyani Lowe hit a home run in the next at-bat. The squad from Chaffey celebrated like crazy in the dugout and hugged Lowe when she reached home base. Rio Hondo tried to respond by making decent hits and create smart plays in the fifth inning. Chaffey were started to get weak and confused at the same time when the Roadrunners were batting. Miranda Fernandez doubled, RBI and Kimberly Rosas scored. The Lady Panthers started to get anxious and the score was 5-2. The home side continued to keep the momentum flowing, but the lady panthers didn’t hold their hands up. The away side were coming back to normal and perform with passion. In the sixth inning, the Panthers scored three more runs making the home team lose their momentum in the last inning of the clash. Rio Hondo lost against Chaffey for the second time and have one more chance to beat them Wednesday, April. 17. However, they must focus on their next clash versus Pasadena City College for an away game on April 11.